Carol Schwartzott: "A book for me is like a journey; along the way the road twists and turns, and sometimes I get lost, but my aim is to arrive at my destination and enjoy the trip along the way. Curiosity, investigation, observation, objects, words or images, intuition, connections and creative application accompany me on my journey. Processes are part of the reason I choose to make books. I love the processes involved in researching, writing, designing, drawing, painting, printing, constructing and binding. Very often, one idea will lead to another, ... My books are assemblages of thoughts, much like the collages I make, layering pieces of fact and fancy, bits of memory, objects mixed and matched, all added (and sometimes subtracted) to explore a theme. It becomes an adventure in searching for connections." Freeville, New York: Lilliput Press, 2008. Edition of 7. 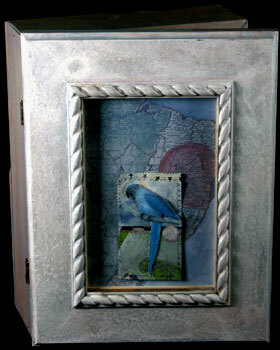 Assemblage housed in 8 x 10 x 4" painted wooden box. Materials include a used picture frame, paper cut-outs of Macaws, glass bottles containing an assortment of found and collected items including birdseed, parakeet feathers, nuts, dried moss, remaindered book, paint, thread, ribbon. Carol Schwartzott: "A modern curiosity cabinet, I like to think of it as a contemporary 'time machine' that visualizes the environment and habits of Spix's Macaw, an endangered and extinct in the wild bird." Techniques: Original maps and bird illustrations from the artist's personal collection of old books were scanned and printed on an Epson Photo 2000 using archival inks and paper. These scans were later hand-embellished using paint, colored pencils, graphite, and inks. Stencils are the artist's hand-cut original designs, printed using water based paints. Shelves and stops are constructed of archival foam core, covered first with japanese paper and recovered with a variety of printed and hand modified papers. 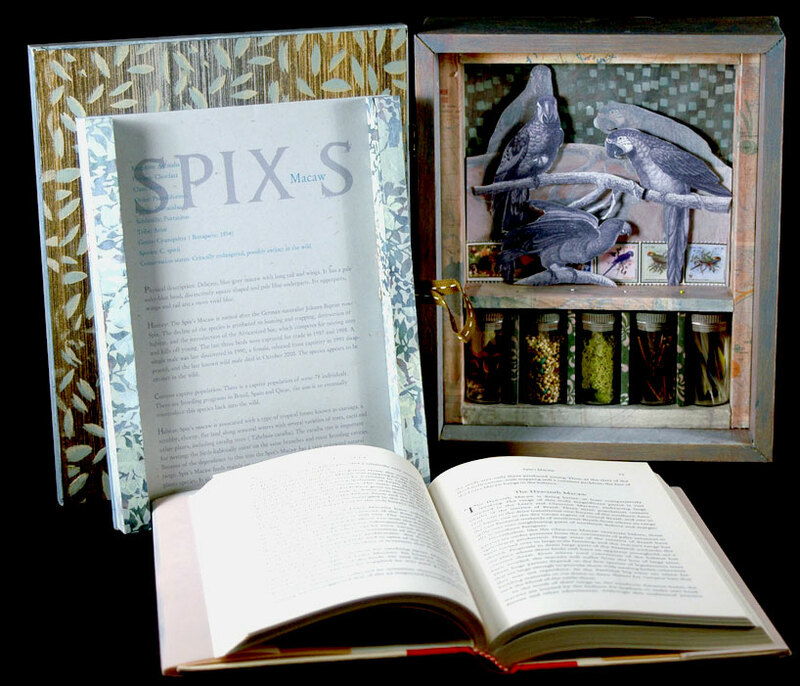 The box houses two layers: above is the book [Spix's Macaw: The Race to Save the World's Rarest Bird by Toney Juniper (Atria Books, 2002)] and below the cabinet with contained ephemera and three-dimensional exhibit. This work originally created for a fund-raising auction. "Faces in the Wild is an annual artist auction aimed at raising awareness and funds for wildlife protection. When I came across Spix's Macaw I immediately thought of presenting this endangered species within a cabinet, a technique that I began using early on in my career as a book artist and continue to enjoy. I frequently find small stashes of interesting materials and am also the recipient of many delightful hand-me-down gifts from friends and very often they seem to find a use in my art. So, the Spix's Macaw project soon housed not only the remaindered book I found on EBay, but a collection of molted feathers from a parakeet, nuts and seeds from some old pot-pouri, dried moss from last summer's flower arrangements, and any number of stencils and paper trimmings that I recycled from past projects." Freeville, New York: Lilliput Press, 2007. Edition of 25. 11 x 6.5"; 50 leaves. Text pages: Mohawk Via vellum. Printed on an Epson 2000P using archival pigmented inks. Illustration portfolios: Moab Entrada with original art, scanned and printed on an Epson 2000P. Overprinted with a linocut to produce opacity and pattern. Additional applications of paint, colored pencil, and graphite used to heighten color and detail. Finished with gold and silver leaf. Lasercuts: Glama natural clear vellum. Lasercut archways with repeat patterns printed on an etching press using polymer plates. Marbled dividers: hand-marbled on Kozuke Japanese paper. Cover: a laser book board painted and fauxed. Title label underneath with brightly colored background behind the floral window. Housed in 12 x 7.5” drop-lid box. Book boards and box bound in Japanese book cloth. Box liner: Ingres Rag paper, handprinted as a collagraph using the positive shapes from the archway of cover. "The book is divided into seven segments, each separated by a divider of hand-marbled Japanese paper. The first contains the title page and introduction and the last an artist's statement, bibliography and colophon. The remaining five are dedicated to the seventy-five quatrains of FitzGerald's first edition. Each contains a vellum window, reminiscent of a Persian archway that opens to reveal my version of a miniature painting." Carol Schwartzott: "This edition of the Rubáiyát uses the 1st edition of FitzGerald's translations. Although it is not considered the best of the translations, it is the original. The completion of this book ends my journey of almost ten years. Interestingly, as I worked on its design and reason I really felt it become a more timely piece. For me the Rubáiyát encapsulates the beauty, intellect, and mysticism of the Persian world. How lovely to focus on what a culture brings to others instead of the brutality, fear, anger, and enormous sadness that the war in Iraq has conjured up and bestowed upon all of us. I wanted the book to be calm, serene, ethereal, peaceful, tranquil. 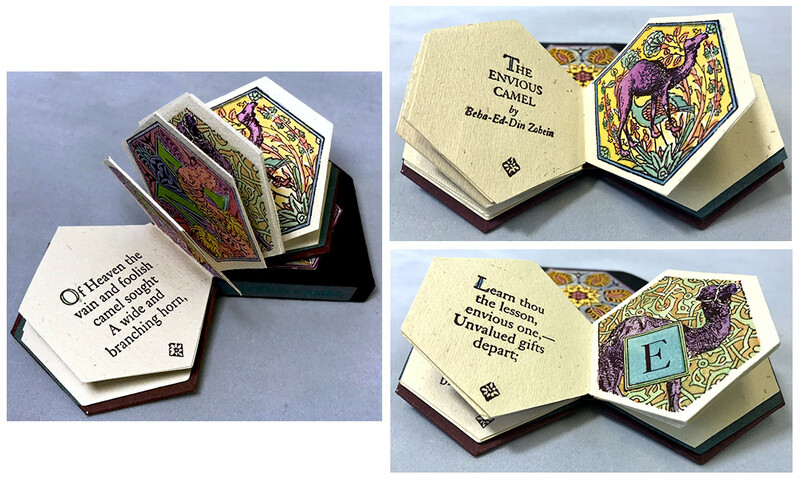 I chose a quiet solution for the typography, the layers of the illustration portfolios peel away like veils, and little dots of color here and there, along with the gold and silver leaf represent the jeweled covers and illuminated miniatures of rare Persian books. Since marbling was an art invented and developed by the Persians, I used it for a segment divider. A simple binding and protective box completed the presentation." 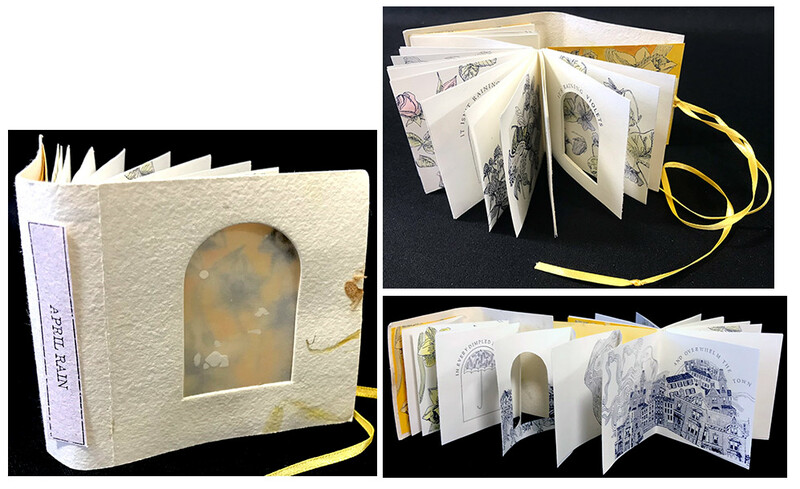 Carol Schwartzott: "The first miniature books I made were very small, one-of-a-kind pieces that I wish I still had.…They were very textural, with layers of gossamer papers, interesting images and sewing. A very good friend who was a gardener for the Shaw Festival Theatre in Canada saw them and suggested I come up with an idea for a little book about the Shaw grounds. After playing with ideas, pricing, packaging, etc. I came up with the format that I later used for … books. These were all offset printed (Edition 500) and the printer cut them down and scored them for easy folding. Each book had something handmade about it." Freeville, New York: Lilliput Press, 2003. Edition of 30. 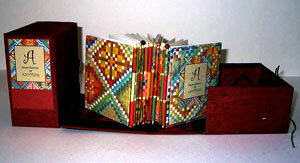 Miniature flutter book 2.4 x 1.75 x .6". Letterpress printed on Japanese Yohko paper. In slipcase. Includes bibliography. Signed and numbered by the artist. A Brief History of the Fan was the sixth in a series of Brief Histories produced by Carol Schwartzott. 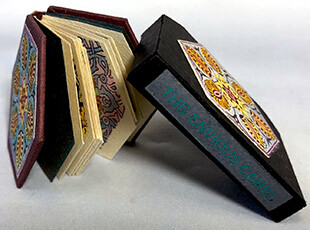 It was a folding paper sculpture which included this miniature book describing the history of the fan from 3200 B.C.E. to the present. The paper structure edition of "A Brief History of the Fan" was 20 books. The miniature included as part of that structure was an edition of 30. Please note: this is only the miniature book. Niagara Falls, New York: Lilliput Press, . Edition of 100. 2 x 2.5"; 104 pages (97 numbered). Computer imaged. 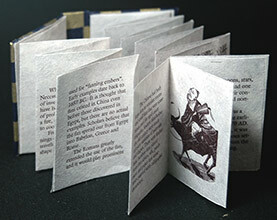 Printed on Bodleian moldmade and Japanese papers. Cochin Italic typeface. Pape-covered boards with label containing image of a bird. Decorated papers asendpapers. In matching paper-covered slipcase with paper spine label. Signed and numbered by the book artist, Carol Schwartzott. 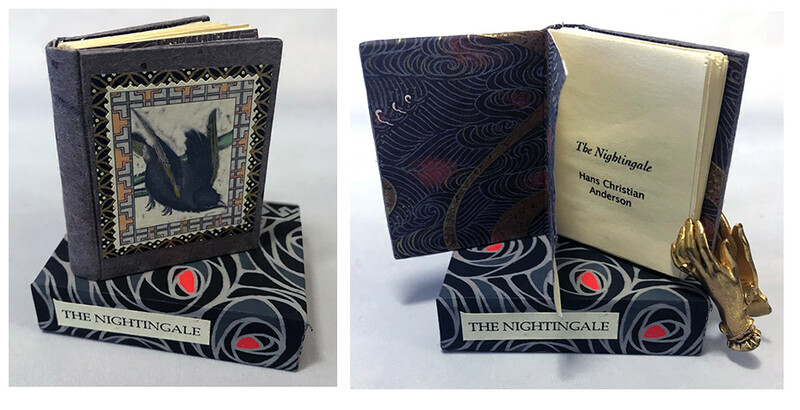 A miniature-book version of the Hans Christian Andersen fairy tale "The Nightingale," a story about an emperor who prefers the tinkling of a bejeweled mechanical bird to the song of a real nightingale. The story is presented identically in each book of the edition, but the papers for the binding and slipcase vary. Niagara Falls, N.Y.: Lilliput Press, . Offset edition of 500. 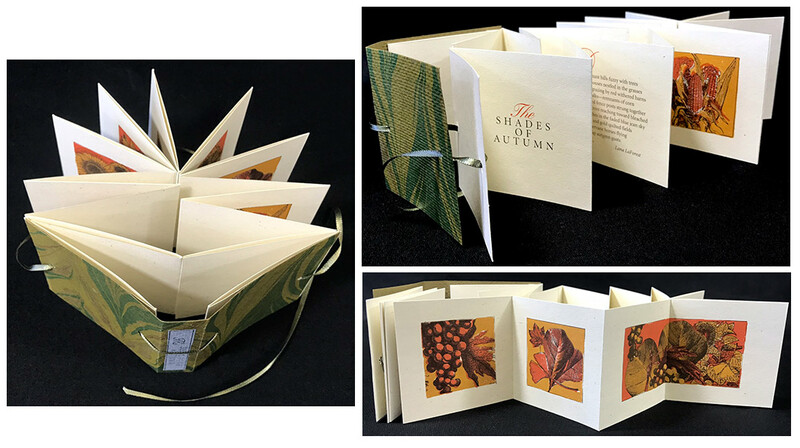 Offset Edition: 2.8 x 2.8" accordion-fold flutter book. Printed offset with hand-colored illustrations. Bound in paper wraps with elephant illustration on front cover. 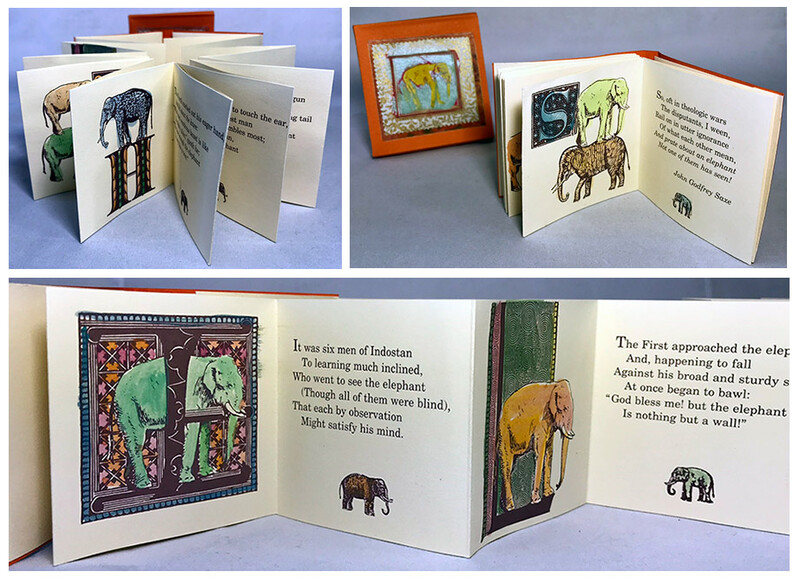 In matching paper slipcase with paper title label on spine and elephant illustration on cover. Book design and binding by Carol Schwartzott. Signed and numbered by the artist. American poet John Godfrey Saxe (1816-1887) based "The Blind Men and the Elephant" on a fable from India. He used it as a means to put forth a little of his own view of the world. Carol Schwartzott: "I found some wonderful tiny boxes at Pier I. They were made in India and one had an Elephant on it, and the other a Camel. I bought all they had! I then proceeded to create a tiny book that would fit inside. I hand-printed (letterpress) and then hand-colored 100 of each of these, but only 25 or so were the 'specials' placed inside of those tiny boxes that I re-painted and gilded. 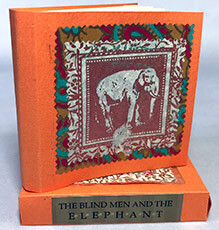 I liked ' The Blind Men and The Elephant' so much that I actually printed another edition offset." Niagara Falls, N.Y.: Lilliput Press, . [Edition of 500]. 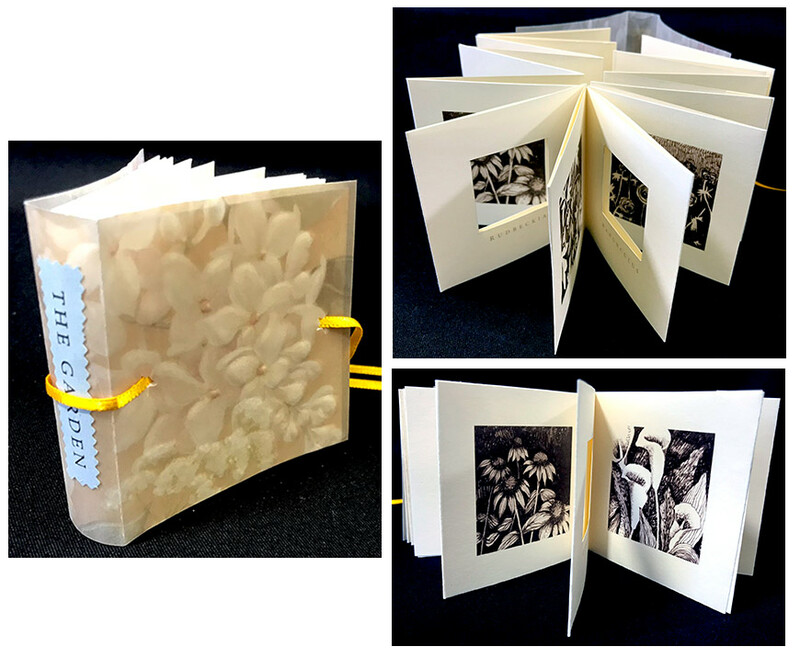 2.8 x 2.8" accordion-fold flutter book. 24 unnumbered pages including paste downs, 8 of these (4 pairs of 2 pages each) have a rectangular cutout window that provides a frame for images made from artist's original drawings. Printed offset. Floral wraps with glitter accents and paper title label on spine. In matching paper slipcase. 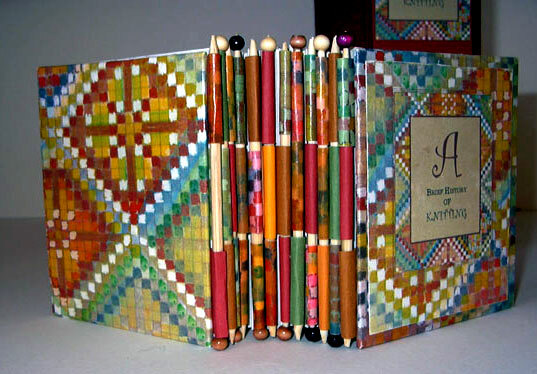 Book design and binding by Carol Schwartzott. Signed and numbered by the artist. 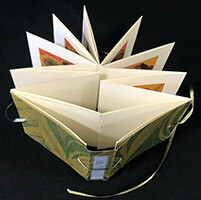 Carol Schwartzott: "The first miniature books I made were very small, one-of-a-kind pieces that I wish I still had ... They were very textural, with layers of gossamer papers, interesting images and sewing. A very good friend who was a gardener for the Shaw Festival Theatre in Canada saw them and suggested I come up with an idea for a little book about the Shaw grounds." "The Shaw Festival Garden" miniature begins with a quote from Christopher Newton, Artistic Director, and ends with one from Ingrid Riedke, Head Gardener. Carol Schwartzott: "These were all offset printed (Edition 500) and the printer cut them down and scored them for easy folding. 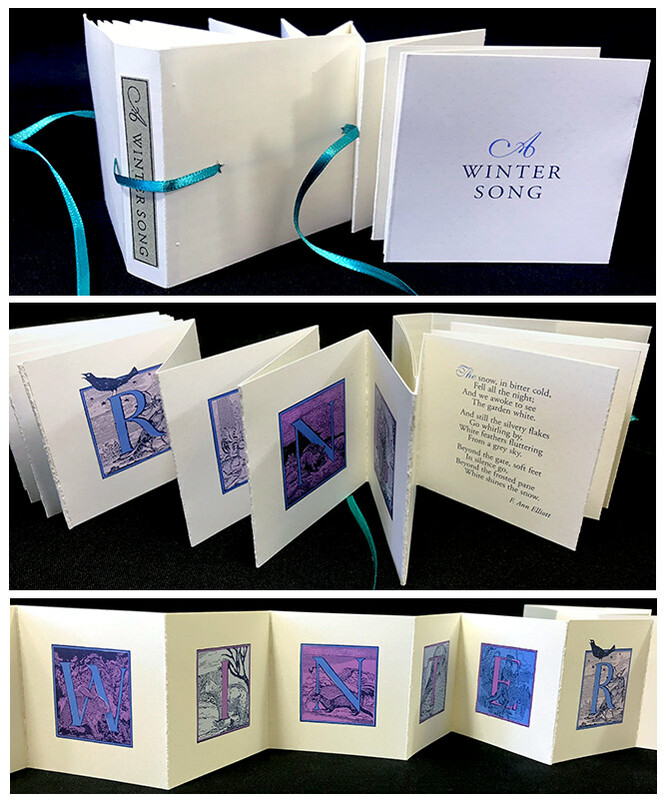 Each book had something handmade about it: The Garden has an embossed cover; April Rain was painted and had die-cut windows; Autumn had a hand-marbled cover; and Winter had a transparent cover and was printed in four colors. I called this group 'The Seasons.'" Niagara Falls, NY: Lilliput Press, 1994. Edition of 500. 2.8 x 2.8" accordion-fold book tied into paper wraps with ribbon. Printed offset. Die-cut windows. 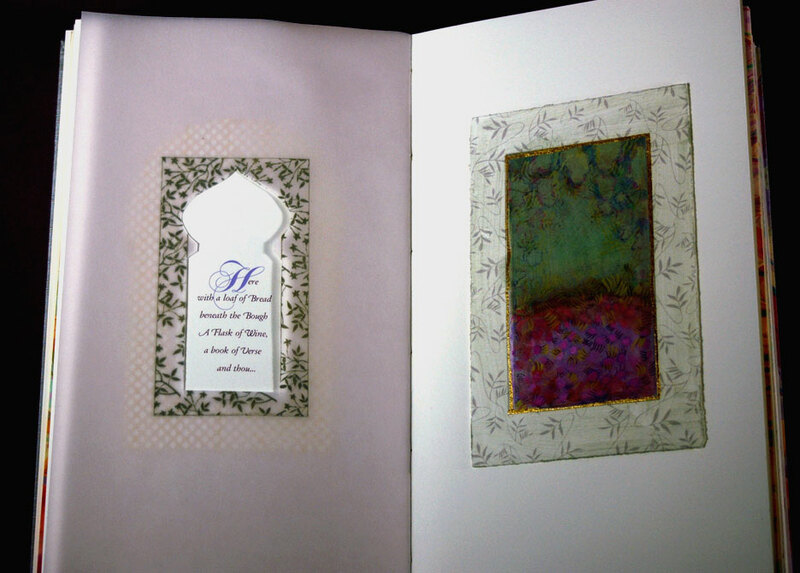 Hand painted end pages as well as two spreads of flowers. 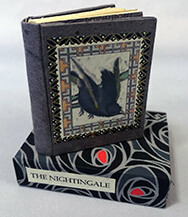 Book design, binding, and illustration by Carol Schwartzott. Signed, numbered. and dated by the artist. One in a series of four miniatures that the artist referred to as "The Seasons." This is the spring book. 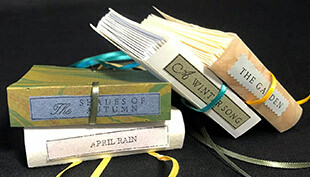 Even though printed offset each book had something handmade about it — "April Rain" was painted and has die-cut windows. With quotations by Gertrude Jekyll and Thomas Reinhardt. Niagara Falls, NY: Lilliput Press, . Second Edition of 500. 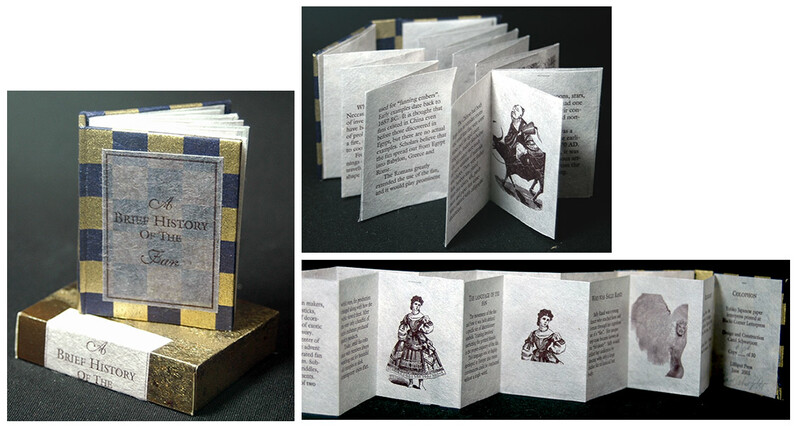 2.8 x 2.8" accordion-fold miniature book tied into paper wraps with ribbon. Printed offset. Original drawings by Schwartzott. Embossed cover. 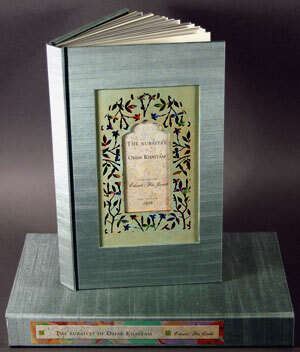 Book design and binding by Carol Schwartzott. Signed and numbered by the artist. One in a series of four miniatures that the artist called "The Seasons." This one is the summer book. 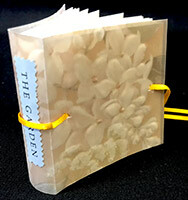 Even though printed offset, each book has something handmade about it — "The Garden" had embossed covers. Flowers from the garden illustrated by Carol Schwartzott are presented in cut-out frame pages. The book begins with a quote from Gertrude Jekyll (Home and Garden, 1990) "The first purpose of a garden is to give happiness and repose of mind..."; it ends with a quote from Thomas Reinhardt, Landscape Architect, "A garden is a maze of experience that grows out of the past and builds on the present." [Niagara Falls, NY]: Lilliput Press, . Edition of 500. 2.8 x 2.8" accordion-fold book tied into hand-marbled paper wraps with ribbon. Printed offset. Book design and binding by Carol Schwartzott. Numbered and initialed by the artist. One in a series of four miniatures that the artist referred to as "The Seasons." This is the fall volume. It contains illustrations with autumn hues and items associated with autumn foliage and harvest. It also includes a quotation from Lana LaForest on the first and last pages. 2.8 x 2.8" accordion-fold book tied into paper wraps with ribbon. Printed offset. Cover wrappers are white vellum paper with ribbon tie. Title label on spine. Numbered. Book design and binding by Carol Schwartzott. One in a series of four miniatures that the artist referred to as "The Seasons." This is the winter book. The illustrations are bookended with poetry. The first poem is by Eileen Mathias who wrote poetry for children. This poem is often found in children's poetry anthologies. The poem at the end of the book is by F. Ann Elliott. 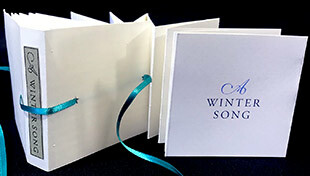 Carol Schwartzott has complimented the text by illustrating each letter of the title with winter remembrances. Niagara Falls, N.Y.: Lilliput Press, . 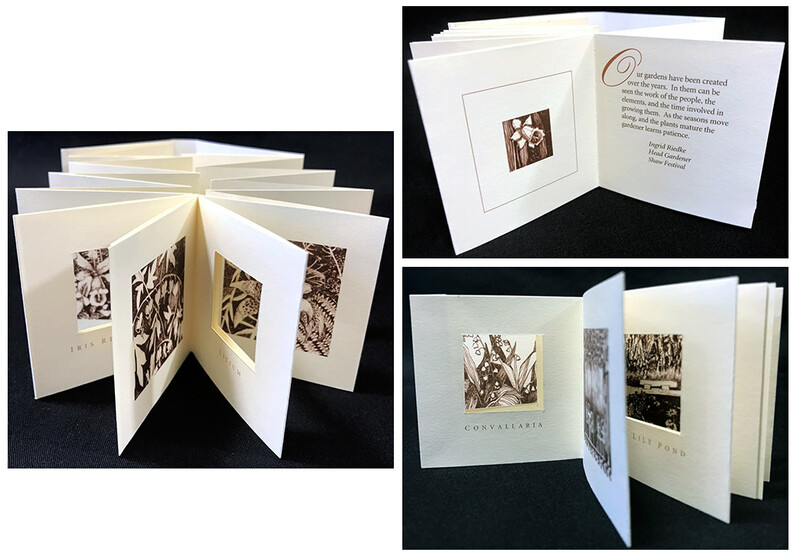 Letterpress edition: 1.5 x 1.5" accordion-fold flutter book. Bound cloth with patterned end-papers. Card slipcase with image of elephant on front. Laid in clear acrylic snap case. Book art, design, and hand-colored illustrations by Carol Schwartzott. Numbered and signed by the artist. These are artist proof copies. Freeville, NY: Lilliput Press, 2003. Edition of 30. Fan with box dimensions 2.75 x 2.13 x 9". 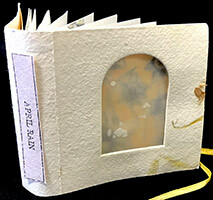 Miniature flutter book 2.4 x 1.75 x .6". Fan dimensions 7.5" high with 12" spread when opened. Fan constructed of rag matboard. Printed on Japanese Yohko, which has been dyed & waxed. Text printed on an Epson Photo 2000 with archival inks. 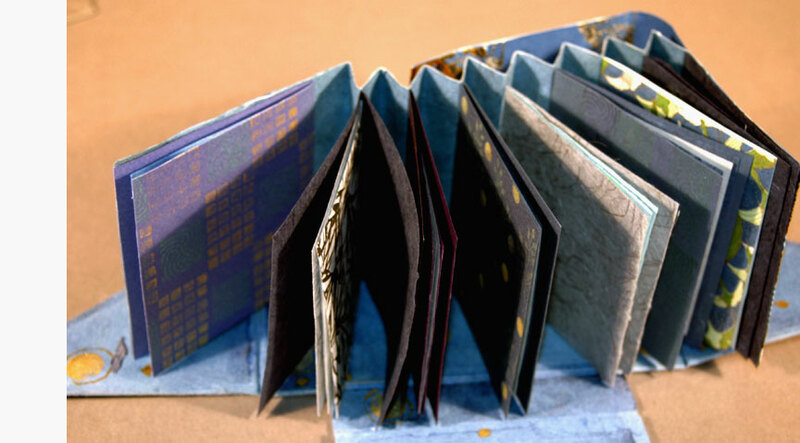 Slipcase and bookboards covered with a combination of hand-dyed and Chiyogami papers. Includes bibliography. Signed and numbered by the artist. Sixth in a series of Brief Histories by Carol Schwartzott. Both an object and a book. Hidden inside a tall slipcase, the fan emerges. When unfolded, the fan contains the rules of fan etiquette on its paper-fan pages. At the top of the slipcase is a tiny lid; within is a miniature book which describes with text and illustration a brief history. Toronto Public Library, exhibition "Art Under Cover" 2008: "This expanding book is a literal re-creation of a fan, a subject that is well suited to the challenges of folding paper sculpture. It is accompanied by a miniature book that describes the history of the fan from 3200 B.C.E. to the present. 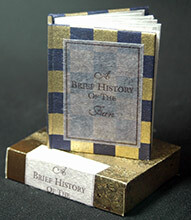 It is one of a series of histories in miniature produced by noted book artist Carol Schwartzott." 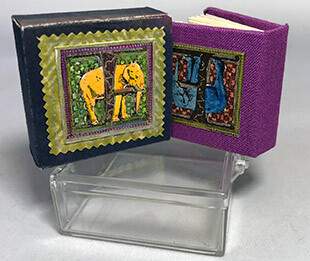 Cerritos Public Library, "Art of the Book: The Book as Art": "This piece, designed and constructed by Carol Schwartzott, features a cylindrical box that contains a miniature book entitled, A Brief History of the Fan. The miniature book provides a definition of the fan, plus a detailed history of it from 3200 BCE to the 1900s vaudeville fan dance star Sally Rand. A short bibliography of primary sources on the fan is also included. "The other end of the cylindrical box contains a stand, which holds the fan and several cardboard dividers describing different ways and symbolisms of holding and moving the fan." 4 x 4 x 2", 37 pages. Housed in drop-lid box. Color Laser printed on acid-free paper. Partial accordion-fold construction, with spine incorporating miniature knitting needles (in a piano hinge construction). A revised edition of the original published in 1999. This newer version contains the same information, uses the same piano hinge construction and drop-lid box as the original, but employs more color. Tidbits of historical information are accompanied by twelve illustrations and three fiber samples of knitting and felt. Niagara Falls, N.Y.: Lilliput Press, 1995. Edition of 80. 2 x 2.25" hexagonal miniature. Printed letterpress. Hand-colored illustrations. 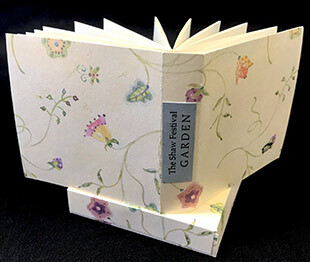 Bound in paper covered boards with hand colored floral illustration on front cover. Signed, dated, and numbered by the artist. In paper slipcase with matching floral illustration on cover. Paper title label on spine. Book design and binding by Carol Schwartzott. This story is based on the Aesop Fable "Jupiter and the Camel." The camel wanted horns like a bull, but instead of horns its ears were cropped. The moral of the tale: Value what you have. 5.5 x 5" in box. The book box is a small folio design, covered and lined in Japanese dyed papers with tie closure of a wooden dowel and waxed linen thread. Text and labels are printed letterpress in black and gold. Type used is Gill Sans and ITC Kendo. papers are a combination of Japanese chiyogami, hand dyed Japanese papers, Indian papers, and archival papers. Hand decorating techniques used include stencil, stamp, gocco-printing, and dyeing. An expandable accordion structure of nine folios is used. Each folio contains a decorative paper, paper slip and a set of haiku poems with crest. The book may be viewed by turning each folio as a page or by pulling to expand the format to view all nine folios at once. 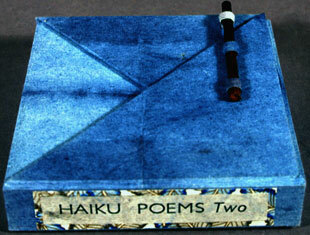 Carol Schwartzott produced her first Haiku book of poetry in 1994, an edition of 50. This is a new book of Haiku, again in an edition of 50.